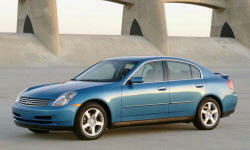 Why the 2003 Infiniti G? Simple lines, aggressive front bumper, wide rear fender stance, two door coupe, mixture of gentle curves and hard masculine edges. Noticeable exhaust note. Still the best looking LED tail-lights around, combination of circle and rectangle. Caribbean Blue is a very unique color! Very silverish blue in dusk sun beams. Very fast braking even with stock non-bembo brakes. I had to hard stop a few times and its ability to stop in time impressed me. Door is heavy, and you feel safe and solid in the car. Being a manufacturer of luxury cars which are at the same time sporty, which is almost extinct in Acuras, and Lexus only has its IS series which has 4 doors and is not as aggressive looking. Not great, but decent power. Why Not the 2003 Infiniti G? Too much plastics. Could use more aluminum/wood and leather. Cars of similar class have more alum (Acura TLs) and wood (Lexus IS, Acura RL). Even the door handle is a plastic coated with fake alum. look. Gauges can be more colorful. Freeway or city driving, AC or no AC, always average out to be around 20-21. No more no less. Ride is harsh is 19" wheels, and factory camber problems cause pre-mature uneven tire wear that creates lots of unbearable tire noise. Only solution is either to get non-staggered wheel setups that allow front-rear rotation, or change tires often. Trunk is extremely low and small. We often have to put things in back seats.